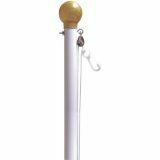 Traditional Flag Poles are simple and easy to install in your front yard or garden. Fly your garden flags to show everyone how much you love your pets or to share the seasonal greetings with anyone who sees it. Small and light weight, these flagpoles can be installed by a single person. These flagpoles are commonly used in homes though multiple poles are often installed in memorial sites. These flag poles are well suited to fly a single 2'x3' or 3'x5' flag. Shop from our collection of Traditional Flag Poles right away and avail the best prices, quick shipping and much more! 100% customer satisfaction guaranteed! Traditional Flagpoles - Simple and Old Fashioned! 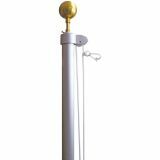 Traditional Flagpoles made of heavy-duty 19 gauge first run steel and finished with white polyester powder coated paint finish will ensure a dramatic flag display in front of your home or garden. Show your team pride, yacht club or national pride by flying a single 2'x3' or 3'x5' sized Flag on these traditional flagpoles. The galvanized texture of the poles prevents rusting and are well suited for long term outdoor use. The accessories that come with our Traditional Flagpolesinclude Gold Vinyl Ball Ornament, Pulley Assembly, Solid Braided Halyard, 2 Nylon Flag Snaps and more. 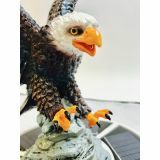 Choose from a range of different models including Titan Heavy-Duty 19-Guage Steel Flagpole Set, wall mountable homesteader 45 Degree Outrigger Flagpole Set, Colonial Aluminum Flagpole Sets and more. 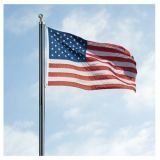 Browse our collection of Traditional Flagpoles to pick up a model that matches your flag flying needs. Not sure which model to shop for? Call us at ourtoll free number (888) 287-3524 or email us at customercare@tuffflags.com and we can assist you.